The cavity is colossal, about two-thirds the area of Manhattan and nearly 1,000 feet (300 meters) tall. It's growing at the bottom of Thwaites Glacier in West Antarctica, and it's rapidly enabling ice melt above it. "We have suspected for years that Thwaites was not tightly attached to the bedrock beneath it," study co-researcher Eric Rignot, a professor of Earth system science at the University of California, Irvine, and a principal scientist for the Radar Science and Engineering Section at NASA's Jet Propulsion Laboratory in Pasadena, California, said in a statement. Scientists spotted the concealed void thanks to a new generation of satellites, Rignot noted. These satellites, which are part of NASA's Operation IceBridge, have ice-penetrating radar. The researchers also used data from a constellation of Italian and German spacecraft that are equipped with an SAR (synthetic-aperture radar) instrument that can measure how ground surface has shifted between images. "[The size of] a cavity under a glacier plays an important role in melting," study lead researcher Pietro Milillo, a scientist at the Radar Science and Engineering Section at JPL, said in the statement. "As more heat and water get under the glacier, it melts faster." This graphic shows how the surface height of the Thwaites Glacier grounding line has changed from 2011 to 2017. The sinking areas are shown in red, while the rising areas are in blue. The red mass in the center shows the growing cavity. The mottled area (bottom left) shows extensive iceberg calving. Thwaites Glacier is about the size of Florida and currently responsible for roughly 4 percent of global sea rise. If the entire glacier melted, the resulting water could raise world ocean levels by more than 2 feet (65 centimeters), the researchers said. Moreover, the glacier acts as a backstop for neighboring glaciers, meaning that it slows the rate at which they lose ice. If those glaciers melted, too, sea levels could increase a whopping 8 feet (2.4 meters), the research team said. Although Thwaites Glacier is one of the hardest places on Earth to reach, more of its secrets will soon be revealed. This summer, the U.S. National Science Foundation and the British Natural Environmental Research Council are launching the International Thwaites Glacier Collaboration, a five-year field project that aims to get to the bottom of the glacier's processes and features. 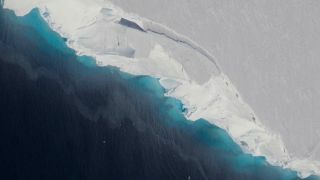 The satellites revealed that the enormous void is hiding under the glacier's western side, the one farther away from the West Antarctic Peninsula, the researchers said. In essence, this means that the glacier at this spot is exposed to the ebb and flow of the tide, which causes the ice at the grounding line to retreat and advance across a region that's about 2 to 3 miles (3 to 5 km) long. However, there's been more retreat than advancement as of late. The glacier has retreated at a steady rate of about 0.4 to 0.5 miles (0.6 to 0.8 km) annually since 1992, the researchers found. This has made the melt rate on this part of the glacier unsettlingly high, the researchers said. Meanwhile, "on the eastern side of the glacier, the grounding-line retreat proceeds through small channels, maybe a kilometer [0.6 miles] wide, like fingers reaching beneath the glacier to melt it from below," Milillo said. Here, the retreat rate of the ground line has doubled from about 0.4 miles (0.6 km) annually from 1992 to 2011 to 0.8 miles (1.2 km) a year from 2011 to 2017, he said. These findings show the complexity of ice-ocean interactions. Hopefully, the upcoming international collaboration will help researchers piece together the different systems at work under and around the glacier, the researchers said. "Understanding the details of how the ocean melts away this glacier is essential to project[ing] its impact on sea level rise in the coming decades," Rignot said.